Hard hats are the first things that come to mind when we think about head protection. They are used everywhere, from sports and everyday life activities, to work. Think back to the last time someone told you to watch your head. What were you doing? We tend to focus on keeping our own heads, and sometimes the heads of those around us safe from harm. While the use of head protection may be commonsense for us, surprisingly, there are those who are not aware of how important it actually is. I would like to share with you why we should wear head protection at work, the most common issues that I have dealt with, and the different types of accessories associated with hard hats in the construction industry. René Descartes, a French philosopher, once said “I think, therefore I am.” I believe this sentence manages to express the importance of the brain to the human body. Our brain functions, therefore we continue to exist. Arguably, the head is the most important part of the human body. It is where the brain, our main processing power and limb controller, is located. It is therefore natural for us to take care of it and keep it safe from harm. Before we get into the details of how we can protect it, let us look at why the hard hat is important. Hard hats are required to be worn in areas where there is overhead work and objects may fall from above and strike the head, and in areas where there is risk of a person bumping his/her head against fixed objects, such as exposed pipes or beams. Head protection also protects people from electricity that may be exposed near the head, such as live overhead cables or exposed electrical conductors. Scaffold erectors often climb the scaffolding itself, placing their heads at risk of bumping the ledgers or braces. I have previously had a hammer drop onto my helmet when I walked past a carpenter working atop a mobile scaffold. There are materials and waste being dropped down chutes. 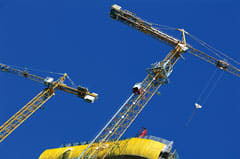 Cranes lift objects above us. People carry lumber or steel bars on their shoulders. A worker may accidentally overextend his backswing when hammering a nail into the wall. These are just a few examples of how our heads are exposed to different hazards in the construction industry. When I first started working in safety, I quickly noticed that workers did not want to wear their head protection whenever possible. As time went on and I became responsible for overseeing the implementation of safety regulations of multiple work sites, and I started to notice that the most common safety violation was the workers not wearing their hard hats within the hard hat area. 1. It is too hot – This excuse is most common during the summer time. The weather in the Middle East can reach more than 50° C (exceeding 122° F). Wearing the helmet while working in these high temperatures causes sweat to fall from the forehead and into the eyes. The workers usually remove the helmet to wipe their foreheads and put it on again, only to repeat the process after a few minutes. The heat buildup within the helmet as well as humidity from the evaporated sweat and no ventilation causes great discomfort for the person wearing it, resulting in the worker preferring to have the helmet – the source of discomfort – off. Response – Nowadays there are hard hats with ventilation openings on the sides and/or on the top. These ventilation openings allow for air to flow within the hard hat and reduce the temperature buildup and prevent humidity accumulation. These hard hat designs have been specifically made for high temperature work places. 2. Uncomfortable – Some employers try to save on costs by purchasing the lower end safety equipment. Some of these helmets come with head straps that are rough or do not include a soft material for the forehead, keeping the forehead touching rough plastic material. Sometimes the plastic itself does not have a smooth finish and causes redness and itching. Response – Comfort is now an option in modern day hard hats. The comfort of the hard hat can be improved by a flexible headband that wraps both vertically and horizontally around the head to fit the forehead. Some also come with an absorbent sweatband that is easy to clean and replace. A variety of cradle strap material allows for a softer feel when it comes into contact with the head. 3. It keeps falling off – I have mainly heard this from scaffolders and people working at height. The helmet they are provided does not have a chin strap which makes it difficult to keep it on when looking upwards or downwards while both hands are busy. If they manage to keep the hard hat on while working, the peak at the front obstructs their view. After having their helmet fall off the working platform and then getting caught not wearing it, they tend to keep the helmet near them at a safe place off their heads rather than having it located a few floors down and out of reach. Response – Chin straps ensure the hard hat stays where it is supposed to be – on the head. There are hard hats that have a smaller, or even no peak, allowing for more unrestricted upward vision for scaffold erectors. 4. I’m not used to it – This is mainly a work culture issue. The workers who use this excuse have most likely come from a work culture that did not implement safety as part of the main work culture. Safety is a new part of the work culture that has not yet been adopted by many companies, thus people who have worked there are not used to wearing any personal protective equipment. Response – This issue is mainly addressed by educating the workers about safety in the workplace. New employees, especially, need to go through the safety orientation training before they are sent to their place of work. The variety of topics discussed in the weekly toolbox talks helps increase the awareness about the different types of hazards and how to deal with them. 5. It diminishes how my ‘position’ is perceived by others – This is an excuse that is usually given by those in higher positions. They do not like to wear the hard hats because it will make them look at a similar professional level to those working under them. Management, especially, like to show that they are different from those working under them, usually by dressing differently. Response – Hard hats come in a variety of colours. The most common colours that I have observed are white, green, blue, red and yellow. Many organisations use the colour of hard hats to indicate the level of an employee’s seniority; for example, white hard hats are usually reserved for management, engineers and visitors. If I wanted to find an engineer inside a construction site, I would simply look for a person wearing a white hard hat. 6. There is nothing above me – Usually this reason is given at locations where there is nothing but the sky above us, such as on a rooftop, an open space on the ground, or at the entrance to the work site near the ‘hard hat area’ sign. Response – While head hazards usually originate from above, that does not mean that they do not exist near the ground as well. Hard hats are also designed to protect the head from being directly exposed to the sun, especially the ones with the ventilation design which are extremely useful in high temperature areas. The peak at the front of the helmet also protects the eyes from the sun. Hard hats are usually designed with attachment extensions along the side. They look like vertical extensions along the edge of the hard hats. There are plenty of accessories that can be attached to hard hats to fit almost any type of job in the workplace. The hard hat accessories are designed as attachments to the hard hats to protect the face without the need to remove the hard hat to do so. 1. Visor – The visors are meant to be used as a face shield that is attached to the front of the helmet. There are two main types of visors. The first is a clear visor that protects the user’s face while not obstructing vision. The second type of visor is the dark shaded type that is usually associated with welders. This type protects the eyes from bright light, especially when the job requires the worker to look directly into the light source. 2. Ear protectors – The ear protectors are attached to the side of the hard hats and then lowered to cover the ears. These are designed to protect the ears from being damaged by high pitched noise, which is usually around 85 decibels. 3. Mirrors – This hard hat attachment is designed to provide the worker with an increased field of vision. This is used in dangerous work environments where the workers can be struck from behind. Hard hat mirrors are very small in size and are easily removable when they are not needed. They are usually placed within the range of peripheral view, so as not to obstruct the immediate field of vision. This is a completely optional attachment and there is currently no regulation that requires the use of this device. 4. Flashlight or headlamp mount – This is a mounting device that is attached to the top of the helmet to allow the worker to free his hands when working in dark places. Instead of needing to hold the flashlight in one hand, the worker can simply attach the flashlight to the mounting device. This attachment is used by people who work in dark places, such as mines or dark, confined spaces. 5. Chinstrap – As mentioned earlier, the chinstrap is a strap that wraps under the chin to prevent the helmet from falling off a worker’s head when he is bending over, or looking upwards or downwards. This is especially needed for those who are working at height. The chinstrap provides the worker with peace of mind that the hard hat will not fall off, and frees his hands for the task at hand. 6. Thick insulating side pads – While not required in the Middle East due to the constantly high temperatures, there are times in the winter where the temperature gets relatively cold. The thick insulating side pads are designed to keep the sides of the head warm in cold places. Management support has the most impact on safety, in my opinion. Management that supports its safety department will most definitely have a good safety record, whereas the management that does not have any focus on safety will have the reverse, regardless of the qualification of the project safety engineer. I am fond of my father’s saying, “Be mindful of the actions you take, because the actions of one person will affect the actions of everyone around him.” It stands to reason that the more senior the position of a person making an action, the greater the impact will be on those around him/her. I have seen several projects where the workers argue that they should not follow the rules because their superiors do not follow them as well. Project managers who do not wear their hard hats usually have engineers working under them who also follow this example and do not wear them either and, in turn, have foremen follow their example and stop wearing their hard hats too, so that their workers also stop wearing head protection. The opposite of this kind of behaviour follows suit. If the project manager takes care in wearing his hard hat, it would ensure that less senior employees would comply with wearing their hard hats, as would those people who worked under them, and so on. The role of the safety engineer in the above-mentioned example is to ensure that everyone is wearing the full,required personal protective equipment on site. The reality of the situation, in most organisations, is that the safety engineer himself works under the project manager, making him as effective as the project manager wants him to be, and allowing the project manager to do whatever he wants knowing that he will not be held accountable. In the few cases that I have seen where the safety engineer is working independently from the project manager, the safety engineer has the power to hold the project manager accountable for his violations of the site safety rules and regulations. My professor once told me that we must do all that we can to ‘pro-act’ to hazards instead of reacting to them. This means that we must find the hazard and take action against it before it causes an accident. We will not always be able to ‘pro-act’ because sometimes unexpected things happen. My hard hat has many scratches, each with a different story to tell, some of which were caused by events happening on site that I did not expect would happen. I have mentioned the different accessories for the hard hats. If you were asked to come up with a new design for head protection for your workplace, what would it look like? If an idea is generated in your mind right now, I would suggest you find someone who can make and test it for you – and make your workplace a little bit safer.